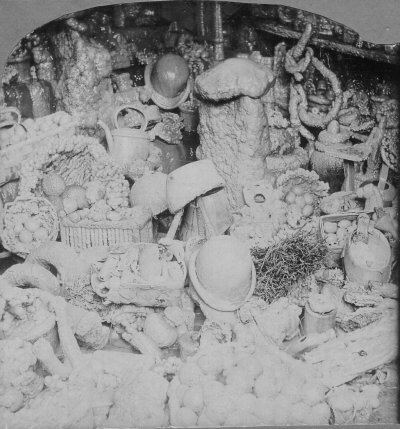 Bottle, bowler, backet of eggs, kettle, cross, and sheep's head. 205a: Left half of a stereo pair. Bowler hats, basket of eggs, kettle, rope, fruit, vegetables, a bird's nest? 205b: Right half of a different stereo pair. 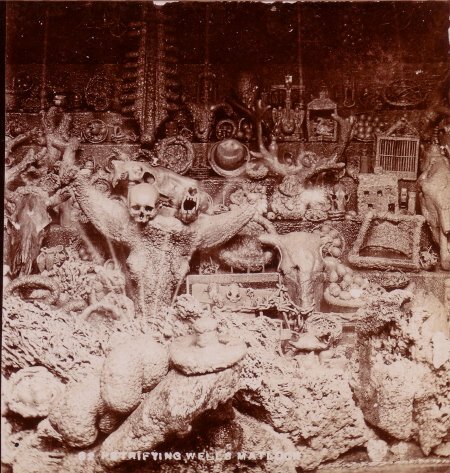 Human skull, tiger's jaws, chain, swordfish, horses skull, donkey's head, basket of eggs, doll's house, angel carving, teapot, cat's skull, swan carving, bowler, antlers. 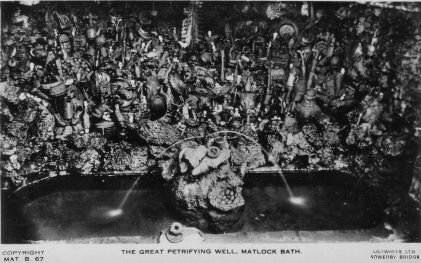 A host of articles left in the well to become covered with water scale, and so "petrified". Most are unrecognizeable, but I think I have spotted the list against each photo. The top stereo photo (205a) is by J Siddon, 4 Clodeshall Road, Saltley, Birmingham, "Agent for stereoscopes and stereoscopic views". The lower stereo (205b) was kindly donated by Vance Nelson of Canada. The resolution is good, and one of the objects looks like a sabre-tooth tiger to me! 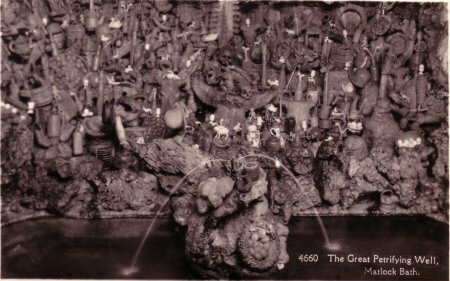 The postcard (205c), also donated by Vance Nelson, has rather poor resolution. 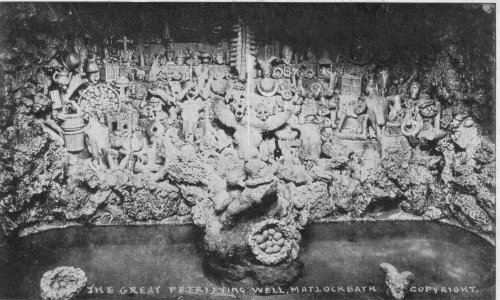 Another postcard (205d) seems to have several different objects from (205c). 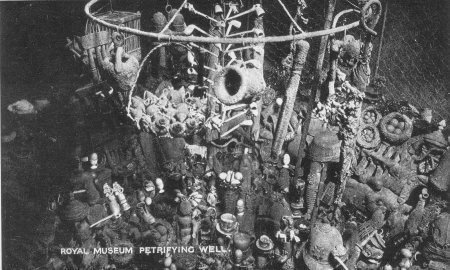 Birdcage, chair, shopping basket, whelks, egg+eggcups, boot, claypipes, teacup+saucer, birdsnest+eggs, Policeman's helmet, man's effigy, whale's vertebrae.